The Driver Challenge is an exciting new way to motivate and coach your drivers. We use gamification to turn every work day into a friendly competition. 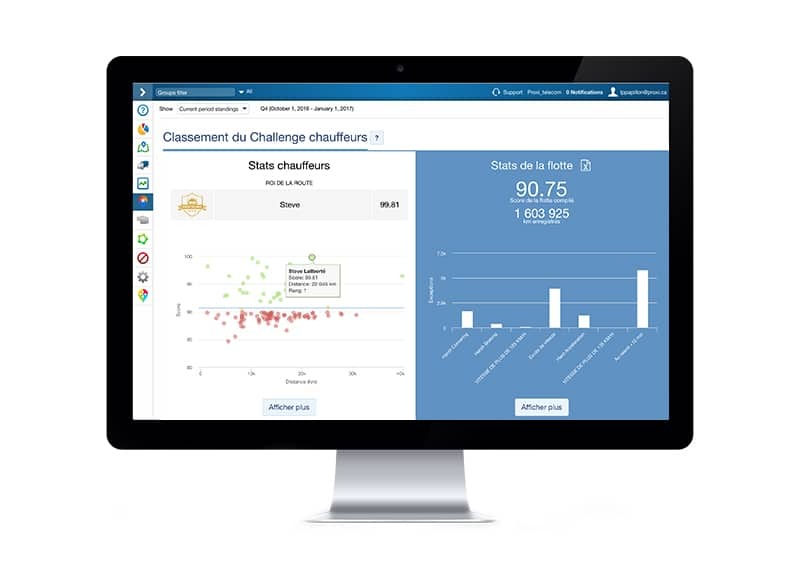 Drivers are scored and compared on KPIs, trends are analyzed to give both drivers and managers insights on what needs improvement and who deserves recognition. Studies repeatedly show significant increases in employee engagement, motivation and retention when using gamification in a learning environment. Gamification is the future in terms of workforce coaching and management. The result is better performance and drivers engagement. It’s hard to improve what you don’t know. Driver dashboards keep them in the loop with real-time updates. Leverage Geotab’s data to fairly score and monitor driving habits. See how your vehicles are being driven into the field. Compare and rank drivers according to your KPIs. See how your fleet is doing and what needs improving. Who’s improving? Who’s slipping behind? Trends show you what’s coming, make sure you pay attention. Your fleet, your picks. Focus on safety, productivity, or what you value most.